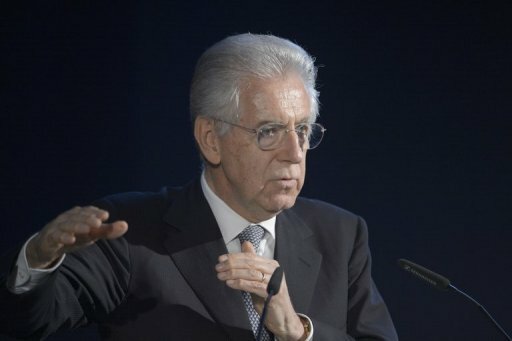 The man of the moment is Mario Monti (pictured above), as the "big four" meet in Rome later today for talks, ahead of the European Council on 28 June. And AFP has a measure of the meeting, between Italy, Spain, France and Germany – referring to "Mediator Monti" and asking whether he will help save the crisis-hit eurozone. Ambrose also offers his take, with a characteristically downbeat piece. He uses a top Italian official to tell us: "Monti is desperate. Reform fatigue has breached breaking point", and: "There is a feeling here that the euro is basically dead already. Unless Germany offers a road map out of this crisis, Monti is not going to be able to hold it together much longer". However, none of the analyses I have seen really focus on the fact that this is a pre-council meeting, with talk of a treaty in the air and a "roadmap" expected from the quartet on where they think the treaty should go. In the past, we've seen this so often, with the big players meeting up before key meetings to agree a common line, setting the tone for the coming treaty negotiations. Thus, while the public agenda will highlight the G20 proposal to buy up Spanish and Italian securities – the so-called "Monti Plan" - there will be a darker purpose to the meeting. Some clue of that came during the G20 meeting when Monti told reporters that: "Decisions on Europe will be taken in the next few days", after calling on EU leaders to "draw up a clear road map with concrete interventions to make the euro more credible". This is when some of those decisions will be made, the like of which we will know not for some time. And that is the way the European Union works … meetings upon meetings, upon meetings. But one thing to note, as Witterings from Witney observed, a noticeable absentee is the UK. By the time Cameron gets to Brussels, therefore, the European Council conclusions will be a done deal, and the UK will have had very little hand in their making. One wonders whether he knows what is going to hit him.